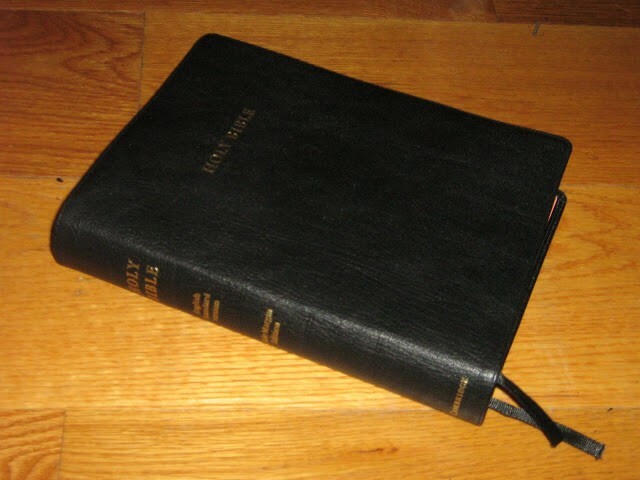 Wide-Margin Bibles are one of the most popular and effective tools for personal Bible study. They allow you to create your own personalized study Bible, inviting you to investigate your own interpretation and experience with the word of God. In essence it is the creation of your own reference tool and doctrinal aid. A wide-margin Bible simply gives you the space to write your own notes around the word of God allowing marking, underlining and highlighting to be augmented by notes, chain references, diagrams, sketches, charts etc. As a graduation gift to myself, I purchased a Cambridge ESV Wide Margin Bible . This is my first wide-margin Bible and I reasoned that if I was going to meticulously write notes in it, I wanted it to last a lifetime. The edition I purchased features a smyth-sewn binding, art-gilt page edges, two ribbons and a genuine goatskin cover. It was a pricey item but I’m planning for it to last a lifetime and contain an entire book full of interpretational notes etc. Mark Bertrand has written an excellent review of the product. Of course this rationale propagated itself and I thought, “If the Bible is this expensive I really should buy a fine point archival quality pen to write in it,” hence my notes are made in an 005 purple Pigma Micron , which is the most heavily reccomended pen for Bible marking and won’t bleed through or cause damage over time. 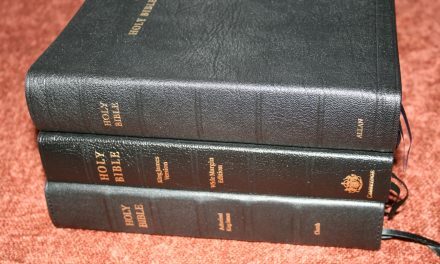 There are plenty of articles on how to use a wide-margin Bible, two that I found helpful were Mark Bertrand’s “Marginal Interest: Why You Need a Wide Margin Bible” and Randy Brown’s “How to Use a Wide Margin Bible.” Both of these posts are highly recommended reading, but leave me in something of a tight spot as most if not all of the points I could make about the advantages and uses of a Wide-Margin Bible have been eloquently explained. I can only point my readers to these articles and reveal my own study methods with my recently acquired wide-margin. I mainly use the Wide-Margin for notes on interpretation. I distrust study Bibles to an extent because of the proximity of an interpretation to the Word of God; however, when it comes to my own interpretation, scrawled and jammed into margins with a purple pen, I feel a little more at ease. I’ve already had to cross a note or two out due to mistakes or unclear thinking, it helps me realize my fallibility. These notes can be altered, crossed out and added to. I plan to go through the entire Bible with my purple pen and then switch colors for another layer of notes, which may include cross-references and word studies. I’m currently restricting myself to notes on interpretation and tracking the literary argument present in the text. I boil down and paraphrase the verses to illuminate the logic of the teaching, occasionally referencing scripture that’s not in the my center column. In college I was taught to “explicate” a text. This method meticulously studies how the meaning of the text is achieved. This means studying the method of the literary elements, discovering how the words are used to structure a point or element. The meaning of the text is illuminated by the author’s means of constructing the meaning and revealing it. 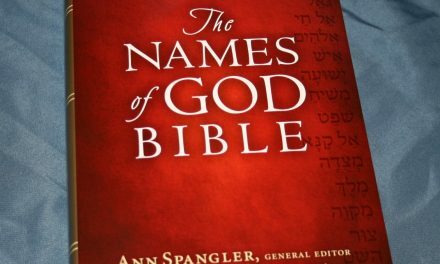 This method reveals the meaning of God’s word by rebuilding the structure and support of that meaning and forces the reader to examine the foundation of the argument and its construction as a means of validating their interpretation. James 4:6-10 is a passage that God has used to humble me and change me over and over again. I spent more than a year reading it every morning and praying over it as God revealed to me that the subject of the scripture was my own sin and double-mindedness. My notes reflect a piece of my heart for this scripture. Both James 4:6 and James 4:10 are verses referring to humility and God’s resistance of the proud. This point in verse six frightens me. If God resists or opposes you then you have no hope. You could not be in more trouble. There is truly no one to help you. You have no divine aid. The context of humility illuminates the entire passage. Submission to God in verse 7 precedes resisting the devil. This humble submission to God’s authority opens the avenues of His grace and provides the strength to resist the devil’s work and wiles. But even greater than that: Satan flees from the humble. This is a radical truth. Satan flees from those under God’s grace and protection; verse 6 tells us that those are the humble. Satan doesn’t flee from the strong or powerful, but those who realize their weakness and cry out to God for help, receiving His grace. You can read my notes on the passage above, which are far from complete but are a starting point for my thoughts and interpretation of the passage. Many times my interpretations are inspired by sermons books etc. and I glean from all over, even occasionally going to my ESV study Bible to find answers to my questions. The practice of placing notes next to the text forces me to interrogate every verse. What does this mean? Do I understand this? How is the writer making their argument? What is their argument? etc. I find that this significantly slows down my reading but gives me an opportunity to inquire of God over many portions of scripture that I let slide past my attention before. The Cambridge Wide margin also includes a large portion of lined note paper in the back, which I am currently using for outlines when I’m called to speak. I don’t really outline what I say, I just keep a list of scripture and brief notes reminding me what the scripture’s about. However, this note paper could be used for just about anything. A more mysterious tool is the “Index to Notes” section which contains a number of columns with each letter of the alphabet. There doesn’t seem to be any specific instructions for the use of these pages; however, one might infer that an alphabetical marking system is used which refers back to this section where notes are written. My plan is to use the sections for topical lists and verse collections (the Z column might be a little spare unless I do a study on Zebulun).If the truth be told, this is rapidly becoming my most valuable study tool. I have learned more from God by asking “What do I write here? What do I have to say about this scripture? What does this mean?” than from simple reading, classifying etc. The wide-margin gives me room to respond to the text and forces me to respond to almost every word in the Bible, this response inspires trembling at the Word.